The sole Fokker F.XXXVI made its first flight on 22 June 1934, flown by Fokker's test pilot Emil Meinecke. Largest of the Fokker transports, it was a high-wing cantilever monoplane with fixed landing gear and powered by four 559kW Wright Cyclone radial engines mounted forward of the leading edge. Of typical Fokker construction, the F.XXXVI provided accommodation for a crew of four, and 32 passengers in four eight-seat cabins. As an alternative 16 passengers could be carried in sleeping accommodation. 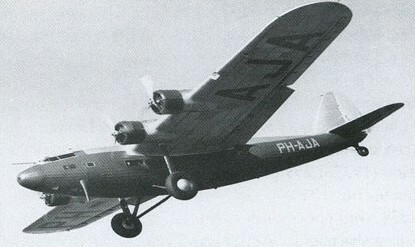 Operated on European routes by KLM from March 1935, it was sold in 1939 to Scottish Aviation of Prestwick and was flown from there as a crew and navigational trainer until scrapped in 1940.